I built this little widget for looking at a selection of Player Game Stats over the last few season. (Best not viewed on a phone). Be sure to check out my blog post explaining what this all might mean. As the new season rolls around, no doubt most inter-county managers are busy compiling back-room teams and scouring the county for new talent. This year will see a spate of new managers taking the helm and everyone is keen to impress, promising everyone a fair crack of the whip again. I am interested in how much that change happens at better or worse counties. Or maybe it’s simply that successful teams don’t see to the need to change, as much, as less successful counties. However at what point does all this change mean that building anything sustainable becomes impossible. What about long-term planning? I wanted to take a look at the size of particular squads and how that might have changed over the last few seasons. Do successful teams have bigger squads or smaller squads? Do they use more or less talent than others? Data: The data is from 2012 – 2015 and I have used a *sample of counties for illustration. Championship games only. The first graph shows simply the number of players used by each county in the last 4 years. Donegal at the top seems like no surprise, but then look at the 5. Of the last 16 provincial titles available, those 5 teams have won 15 of them!! (Cork won their’s in 2012). So is squad size really an issue? Is strength in depth as important as we think? Should instead a county be looking to develop a core group of players. There will be timing issues. Maybe Cork & Tyrone are just at a particular stage in their team’s life-cycle, but it is interesting to note that they have really struggled to be successful on the pitch and in that time have found themselves using 47 and 55 players over the last 4 seasons. When you look at the sheer number of players teams like Antrim, Carlow & Derry have used and consider that these counties do not have long championship seasons it really is staggering to think about that level of player turnover. So perhaps total players doesn’t tell the full story. Mangers might be happy to throw some young players on when a game is won or they know the season is about to end. The next graph looks at Core Players – those that have started at least 1 game (in blue) and those players who have only featured as substitutes (in orange). Donegal definitely jump out here as having by far the smallest Core group. Only 25 players have started a game for Donegal since 2012. But again we need to ask – is that important? While the other (successful) counties have used more, it’s not like they have used double the amount. We see a very similar pattern to the first image with some exceptions. Clare seem to have a core group of 33 players but have use 14 different subs, perhaps suggesting that while the core has remained relatively steady there is high turnover in the fringe players. Wexford and Wicklow look to fall into a similar pattern. Again Cork and Tyrone seem to have big squads but have also used many different starters and combinations. Hardly the sign of a settled squad or team. Do successful teams have small squads because they are small or are they small squads because they are successful. That question will take me a little longer to answer but I’m not sure I buy the idea of more is better. Despite all the talk of the importance of a big squad it seems the answer probably lies somewhere in the middle. Getting a good group of core players who you can work with over a consistent period of time, but not so small you burn them out. McGuinness often spoke of working with teams in a 4 year cycle, similar to Olympic athletes. But how many mangers are given that time? So as managers contemplate shaking things up for the season ahead – they need to ask at what cost does the shake up come? Yesterday I wrote an article about an expected points (ExpP) model I had created for football. This is not a new concept. Dontfoul has a weighting model, there are numerous examples for most field sports and Golf has a strokes gained metric. They all work off the same basic principle. How much better is player X than the average player. Granted this comes with a lot of question’s about who this imaginary average player is, but the results of these models can be fascinating. As the All Stars list has been announced and the team will be selected along with player of the year there is at lest 3 positions where we don’t have to rely solely on opinion. The forwards. Sure we can turn to the Top scorer chart, but what does that really tell us? The structure of the championship means it is virtually impossible for anybody but a small group of players to win this. Some teams play 7 games while 16 teams will only feature twice. What is interesting is that we can now compare these players to what the average inter-county player would have scored given the same opportunities. So did Bernard Brogan score 39 points this year because he plays he get’s easy chances, because he is supremely good or a bit of both? Likewise for Cillian O’Connor, his his score total dominated by handy frees? Below is the top 20 players based on Points above Expected (Shots gained if you are a golf fan). 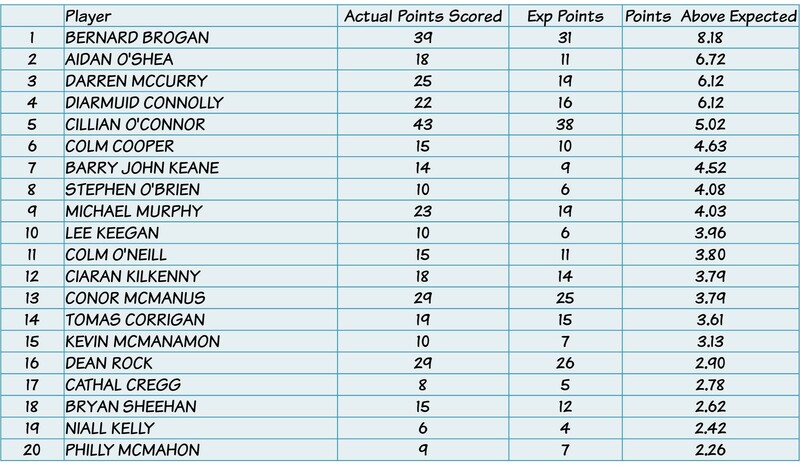 Bernard Brogan, not only scored 39 points and won an All Ireland title, but compared to every other player he added 8 points more than the average footballer. To contrast this with his season in 2014 shows the value of these metrics. In 2014 he scored 24 points, not a bad return, and one that puts him in the top 10 scorers for that year. However an average footballer would have scored 27 points given the same opportunities. So in fact that’s a -3 point in 2014. Same player, in 2 consecutive seasons being in the Top 10 scorers but the numbers telling a very different story. For reference here is the Top 10 in 2014. *Note the ExpP model is based on games I have analysed. In all cases for comparisons between ExpP and Actual Points I have used the actual points scored in games analysed rather than their season total across all games. Football (and Hurling to an even bigger extent) operates in the universe of small numbers. Dublin & Kerry have played each other in just 25 Championship games in the GAA’s 125+ year history. In a very similar period the Yankees have played the Red Sox 2,130 times!! Comparing era’s and teams in that historical rivalry carries much more weight than the one on this island. Westmeath were 8 points down at half-time in a seemingly one-sided Leinster semi-final. Meath capitulated and Westmeath went on to win by 4. The first time the have ever beaten their near rivals. The following day’s papers were full of headlines like; Tom Cribbin’s tough love pays off for Westmeath, following is very public criticism of his players during the national league. This all despite the media being heavily critical of the ‘rant’ at the time, in hindsight it seemed they were happy to change their mind. By most accounts Westmeath’s season was heralded as a success despite one second half performance and going on to only score a further 13 points in their remaining 2 games. Fermanagh another team being picked as a ‘weaker’ county punching above it’s weight this year, beat Antrim twice, granted had a very good win against an out-of-sorts Roscommon team and had a moral victory against Dublin. At the other end of the scale Cork had a terrible year, resulting in the resignation of their manager. Despite pushing Kerry to the pin of their collar in Killarney, Kerry required a lucky inspirational point in the dying minutes to force a replay. Cork couldn’t seem to raise themselves for the replay or the qualifier game against Kildare 7 days later. Dealing in these tiny sample sizes makes it very difficult to separate the signal from the noise. How much of that Westmeath 2nd half display was down to a managerial rant 3 months previous, or tactical changes at the break? Was Fionn Fitzgerald’s point lucky or calm execution of skill honed on the fields in the Kingdom.? Shots is perhaps the easiest performance characteristic to attempt to separate the signal from the noise. To do this we can examine what the ‘average’ footballer would expect given the same shot location. This metric is similar to those found in most sports. Soccer has expected goal metrics and Basketball has an Expected field goal metric as just 2 examples. I have broken the pitch into 5 x 5 square zones. Giving 13 zones long and 18 zones wide (234 zones in total). We then take the average return (Scores / Attempts) for each zone and work out what the expected return for the ‘average’ footballer from that zone would be. Because of the difference between shots from play and placed ball we need to create 2 set’s of ExpP. Actually we create another one for Penalty’s. Let’s look at an example; Taking a free in front of the goal and on the 21m line (zone 5;8) gives a 100% expected return for the ‘average’ footballer. We would not expect anybody to miss from here. If, hypothetically, a team took 10 frees from this position we would expect them to score 10 points. 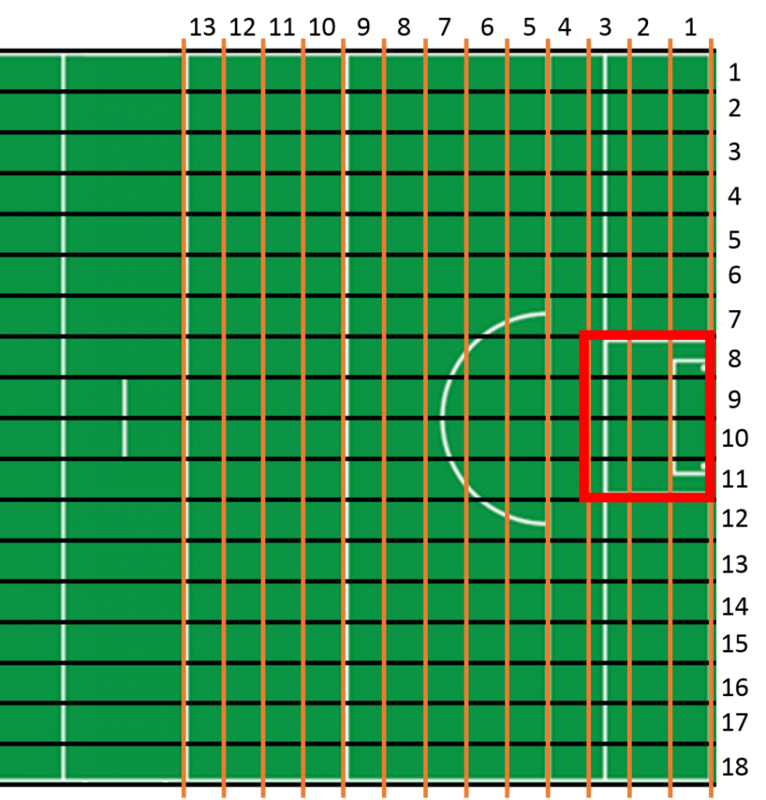 If we look at the same zone but from play we would expect the ‘average’ footballer to score 50% of the time. If our hypothetical team took 10 shots from this location we would expect them to score 5 points. We can plot the shot location of every shot for each team – we add all the expected returns to see what a team was expected to score based on the chances they created. In any one game a team will score more or less than the ExpP but this is randomness – the ExpP should give us a more accurate reflection of what the true value of the chances created was. So to bring us back the the Fionn Fitzgerald shot we can look at the true value of that shot. When I plot that shot it goes into zone 9;13. The average return from here is 27%!!. To put this another way; that shot only just over 1 in 4 times.The reason we like sport is because sometimes we don’t know what will happen and there are no second chances under the same conditions. Cometh the hour cometh the man and all that. The shot sails over the bar, Kerry live to fight another day, their manager becomes a tactical genius again and the show moves on. However Cork can count them somewhat unlucky based on that single event. If you pause the game at that point Cork are the overwhelming favourites every-time. Let’s take a look at the model on a team level. If we take the recent game between Mayo and Donegal we can see what each team was likely to score based on the chances they created. Dealing with goals presents a slightly different problem than other sports with a success/failure scoring system. If a shot is taken inside the red zone (above) I am making (a possibly unrealistic) assumption that this was a goal scoring chance. For chances in these 12 zones I multiply the expected return x 3 to more accurately account for goal chances. This is not perfect but it’s a start. Donegal: The model shows Donegal’s ExpP was 13.3 (they scored 11). That’s pretty close. The reason for the over estimation is probably that Donegal had 2 goal-scoring chances with an ExpP of 3.2 but took neither. Mayo: The model shows Mayo’s ExpP was 17.3 (they scored 19). Again not very far off. The Lee Keegan goal brings the actual above the ExpP. My model assumes this is a shot for a point (as it falls outside the 12 goal scoring zones) so therefore underestimates the ExpP. Just to check I looked at the Monaghan v Tyrone game. Monaghan scored 14 (ExpP = 11.7). Shows just how off they were on the day. Even with a bit of luck they fell short. Tyrone scored 15 (ExpP = 15.9). As good as Tyrone were on another day they could have scored slightly more. This is only a starting point, in no way am I saying this is perfect. But it’s a hell of a lot better than spouting on again about desire and workrate. It’s a squad game. Invariably if a team brings on a Sub and he scores a vital point we all hail the strength in depth of a squad. Donegal have too small a squad, the Dubs have an abundance of talent and Kerry’s bench is packed with All Stars. But how do teams use their squad and is there any truth to the cliché that it’s a squad game. 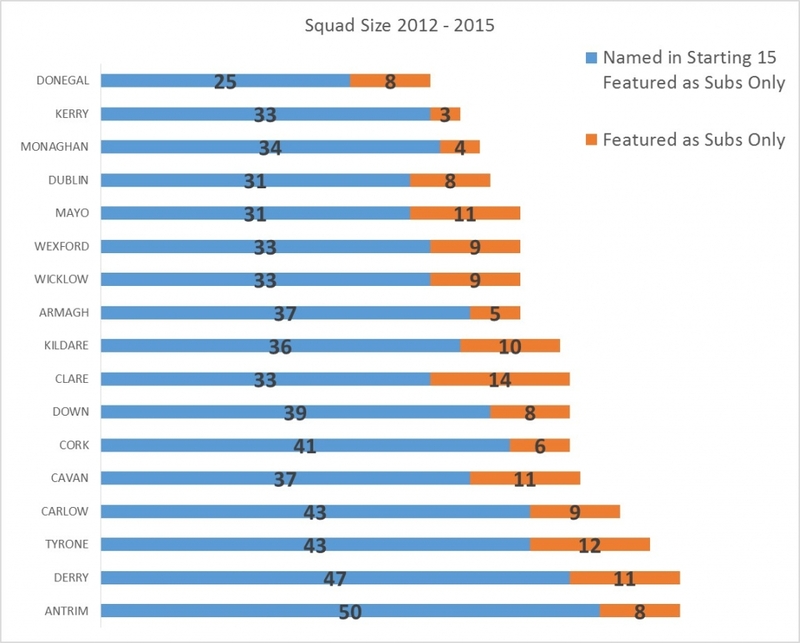 The average Squad size in 2015 is 25. Sure you have some variance. Sligo at 21 and just 8 subs used in their 3 games does seem low. Westmeath & Roscommon top the pile, having used 29 players each in their 4 games. What about the superior 7 counties? In the first graph you will see that the number of players used is not all that different. Tyrone played 7 games which might explain their high number and Monaghan do look a couple of players short but the others; Cork, Donegal, Dublin, Kerry & Mayo are all very similar. Ok so just because a team used X number of players doesn’t mean much on it’s own. The second image shows how many players have started every game and how many have played max game time. The stand-out numbers here is that just 5 Kerry players have started every game. This is half the number for Dublin, Cork, Donegal, Monaghan & Mayo. It really does show how willing Eamonn Fitzmaurice is to change his side from game-to-game (or does he just now know his best 15?). Only Sean Kavanagh played max game time for Tyrone! Tyrone managed to use a lot of different players giving them good game time, starts and still reach a semi-final. What does squad depth really mean? Players used, starts, game-time? Or do we just weave a narrative after the fact? There is so much talk about Dublin’s Kickouts I thought it would be worth sharing some data that people could explore. This visualization contains *some Dublin Kickouts from the last 2 seasons. *TV companies don’t show all kickout locations, especially at the speed Cluxton kicks it out. There can be little argument than Stephen Cluxton has changed what it means to be a goal-keeper. His All-Ireland winning free taking aside his skills from the kicking tee, picking out runners with an accuracy previously unseen, have changed the role completely. So how dominant are Dublin at Kickouts? Since 2011, in 22 Championship games, Dublin have only had 3 games below the national average. 69% is there worst performance in the last 2 campaigns. Last season teams at best won 1/4 of Dublin’s Kickouts. As you can clearly see – teams struggle. Laois winning just 25% of their own kickouts in 2012 is a stand-out. Some teams have done quite well, noticeably Mayo (2013) & Laois (2014) but those big performances are few and far between. While their dominance on their own kickouts is something of considerably note – it shouldn’t be underestimated how effective they are at stopping the opposition securing primary possession. Gives an idea of the task facing opposition teams visiting Croke Park. There is only one way to play football – like it was played in the good old days. When were those good old days – and what were was the game actually like? As has become custom, there is plenty of discussion about the death of football. Hand passing, cynical fouling and blanket defences are the problem. Perhaps amazingly Joe Brolly would like Mickey Harte (and every other manager) to entertain the masses. Yes Inter-County Football is essentially an entertainment product but it’s not Mickey or Jim or Rory’s responsibility to entertain is it? I’m sure Brolly is not adverse to the limitations of eye-witness testimony and it is worrying that he commands such an audience and bases his thoughts on the current game on his own eye-witness testimony. Tainted by every conceivable bias and very strong beliefs that there is simply only one way to play football, he is dealing in opinion rather than facts, which is his prerogative I suppose. I wanted to look at the facts. Let’s deal with the death of football and see what that looks like – maybe we can even come up with some ways to fix this dreadful game! Championship 2014 was the highest scoring championship ever. Ok that cheats a bit – there are more games than ever. But it’s the highest scoring championship since the qualifiers. So how about average scores in Championship games since 1970. It still UP. If football was truly getting too defensive wouldn’t you expect to see scores decreasing? Instead we find ourselves not just with the highest scoring Championship ever but the highest average per game.But maybe scoring is not entertaining? What about winning margins. No Change! So we have the highest scoring championship – and again despite the rhetoric the gap between winners and losers is growing. It was the same in 2014 as it was in 1970 and has fluctuated wildly in between 4 – 9 for the last 40+ years. Not all scores are created equally. Just because scoring is up that tells us nothing about what type of scores. Surely now there is a bigger % being scored from free than from play? My database doesn’t break this down for every game, however we can work with samples(televised games). Looking at games from the last 3 years (league games and at least 500 scores per year) we can see the breakdown of scores. From this we can see that the breakdown of scores has changed – is it a dramatic change? I will leave that for you to judge. 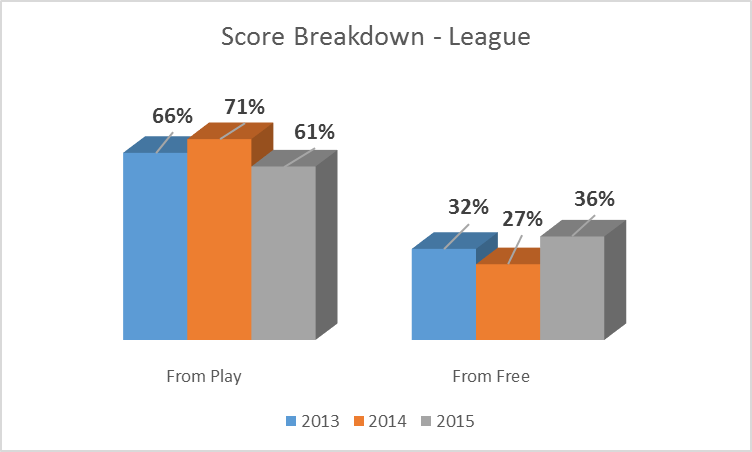 More scores came from play in 2014 than the previous 3 years. These are very minor changes – but hardly a signal for the death of football? I have no issue with what direction the game takes – that is up to higher powers than me. You might not like hand passing and what to see more high-fielding and that’s fine. My argument is please be clear what you mean by the death of football. Is it just the style you don’t like? That’s a very subjective opinion to hang the future of a sport on. Any analysis of where the game is at and monitoring its future should at least look at the facts and not just rely on eye-witness testimony. The death of football looks distinctly like it’s past! Below is a list of Top Scorers from the 2014 Football Championship. While it is a fun table to look at at the end of the year, the format of the Championship makes the Top scorer an odd measurement of performance. After all you need to be a good forward on a good team to have any chance of making this list. Cillian O’Connor had a great year but he played New York and 2 games went to Extra Time, so his opportunities to score were quite high. A very simple way to evaluate forwards is based on their time on the pitch. 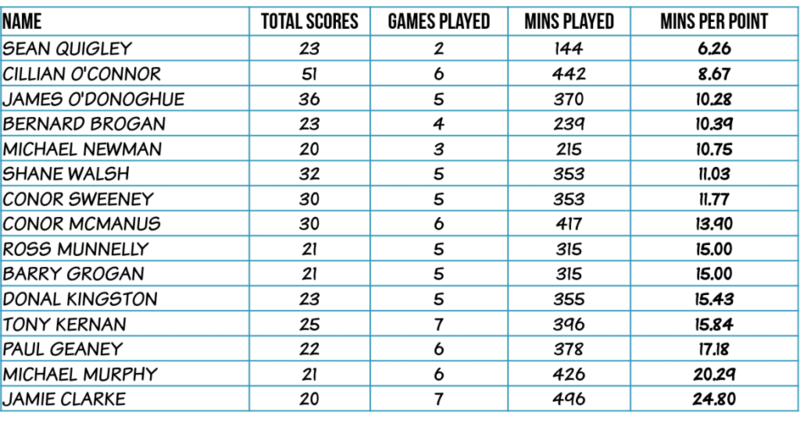 The table below simply takes the Minutes Played by each forward and divides by their total score. This gives us a new calculation of Minutes Per Point. So on average how many minutes did each player ‘need’ for each score they got. 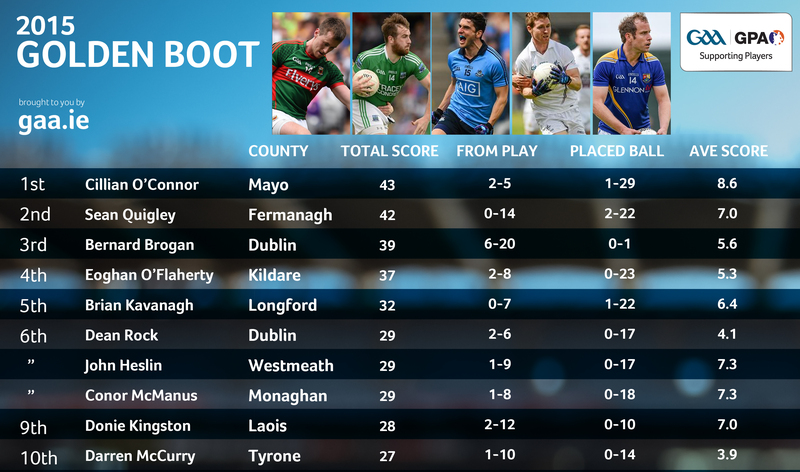 Sean Quigley jumps to top of the list with a very impressive Score nearly every 6 mins of play. Michael Newman doesn’t make the Top 10 scoring list but appears here at number 5 with a score nearly every 11 mins. Also worth noting that there are only 3 All Stars on this list, perhaps some data might help when they pick the 2015 list!! It’s not a perfect measurement but does offer some additional context that the raw scoring chart fails to pick up. *Update – Below is the Table just counting scores from play. It can be hard to rank forwards in any meaningful way. Teams play such a diverse range of opponents and styles that simply looking at Total Scores or Shooting % can be a bit misleading and counter-productive. I wanted to look at a way that would allow for a better comparison of forward play, accounting for both their style and efficiency from play. Copying some of the techniques used by Kirk Goldsberry in his much acclaimed Basketball paper we can come up with some nice and simple techniques to achieve this. The idea is quite simple. Break the ‘scoring zone’ into 3 very distinct areas. Long Range: Any zone not included in the above. The image on the right shows what this looks like overlayed on a pitch. Within each range we can look at two things. 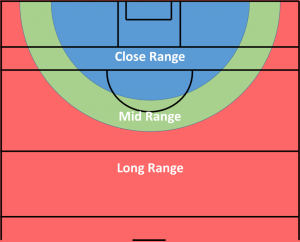 What % of shots does forward X take from each zone. This is called the Frequency Split. What is forward X’s Shot % (Scores/Total Shots) in each zone. This is called the Efficiency Split. The table below shows both the Frequency Splits and Efficiency Splits for 4 marquee forwards. To take Bernard Brogan as the example. In terms of shot efficiency, Brogan shot 48% from Close Range, 35% from Mid-Range and 36% from Long Range – ‘surprisingly’ below average (of top 20 shooters) in the Close and Mid-Range zones. By contrast we can see that Michael Murphy shoots 60% from the Close range but only takes 33% of his shots from that zone. This reflects a very different type of forward. Murphy’s role is much broader than Brogan’s and this is reflected in the Frequency Splits. All other things being equal, if Murphy was getting the same shots as Brogan we would see a 12% higher conversion rate. Obviously the standout forward in terms of efficiency is James O’Donoghue with 70% from close range and 53% from Mid-Range. The fact that he takes such a large amount of shots within the Close-Range helps a lot and should worry any opposition. I have less data for O’Donoghue than other players and it will be interesting to see how he gets marked in 2015, but looks like you won’t find him taking many shots from +40 meters. Cillian O’Connor had a phenomenal year this year and his numbers are impressive in the Close-Range, but push him out a bit further and defenders might see a bit more joy as his return dips below the average. This method allows us compare styles through the Frequency Splits. This differences in playing style can be dictated by the player themselves or the management but either way it offers us hard of evidence of just how different these 4 forward are. Combining the frequency and Efficiency splits allows us compare different forwards given similar shooting opportunities. 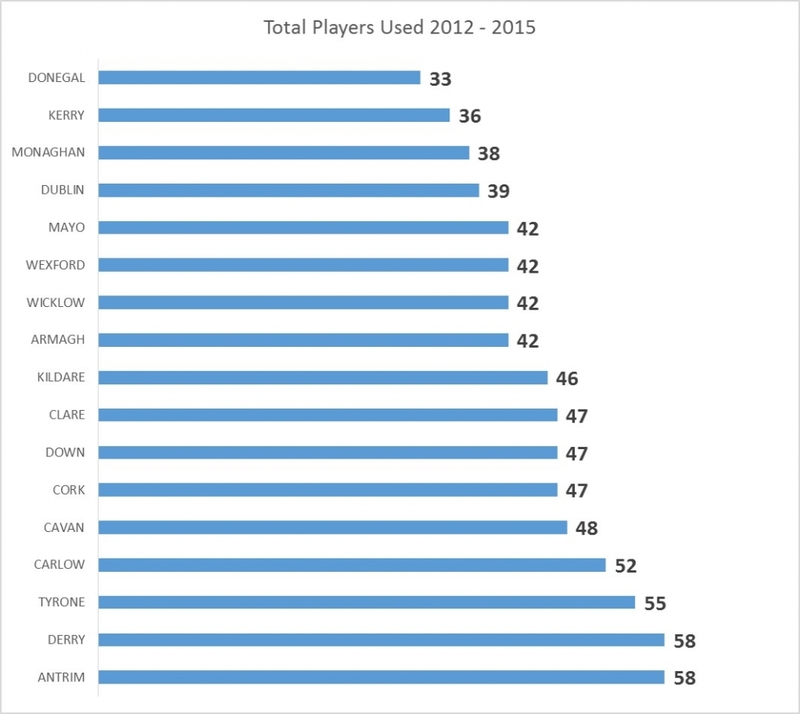 Perhaps surprising is that Bernard Brogan is below average in the Close and Mid Ranges. There is obviously more to his game than just shooting, but given the same opportunities the average forward would convert more often. Murphy’s role is also intriguing, no doubt he offers something anywhere he plays but, based on these figures, it’s quite obvious how devastating he is close to goal. Would be interested to hear your thoughts….